Mysterious and enigmatic, abstract and impenetrable, the Zen gardens of Kyoto are a product of enlightened and sophisticated culture whose aim was to transcend nature by means of a man made nature. The empty space, the surrounding landscape and the frame of mind of the viewer are all part of the design. A design that transcends representation, meaning and ideology. A powerful idea distilled to simple ingredients, the evaporation of art as we know it. The book is a collection of photographs I took and small poems I wrote during my journey to the Zen gardens of Kyoto. I felt it is impossible to untangle their mystery with the rational instrument of reason. It is a stream of visual and versed thoughts on the joyful occasion of simply being there. Accompanying my photographs and poems are several short verses from Basho, Ryokan and other Zen poets. Their words have sometimes been modified to fit my own frame of mind, using their verses᠆ superior ability to express my own feelings. This book is about the frame of mind and the geometry of calm that the Zen gardens of Kyoto represent. As there are no explanations on the walls of the gardens as to the meaning of the sand patterns, so is my book void of explanations and floats on a visual lotus, like an imaginary house. 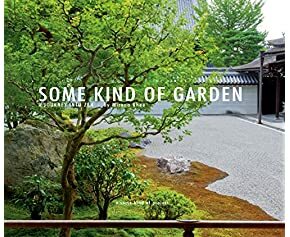 This book is a photographic essay about the Zen gardens of Kyoto, designed specifically for the Kindle and features stunning, high-resolution photographs accompanied by small poems I wrote and small verses by Zen poets. It is crafted to create a calm space of the mind, a vision of tranquility and peace. The title derives its name from an ongoing photographic chronicles I called “some kind of" project, of which Some Kind of Garden is the first volume. It is a gorgeous Zen Book with Very Large Photographs and Very Small Poems. I call these Zen Gardens the Geometry of Calm. For me going to Kyoto was getting into the Zen space of the Mind. Japanese Zen Gardens have very little to do with Horticulture and a lot to do with sophisticated culture refined by the teachings and reflections of Zen Masters, whose sole focus had been to contemplate and distill reality to simple, vanishing abstractions. Why some kind of? Some kind of is a larger body of work that started long time ago and contains Photographs, Video and Text. Some kind of is a thread that runs through all of my work and hops on various obsessions like one of those Stepping Stone Bridges in my book. Enough said, Get Your Zen fix Now! Featuring small poems by Shiko, Hanshan, Ryokan, Huang Po, Basho and myself. With my poems being the smallest poems.